The underside of the upper wing has now been pre-rigged. Also the fin bracing has been done as well as the steerable tail skid control lines. Mike that is amazing! 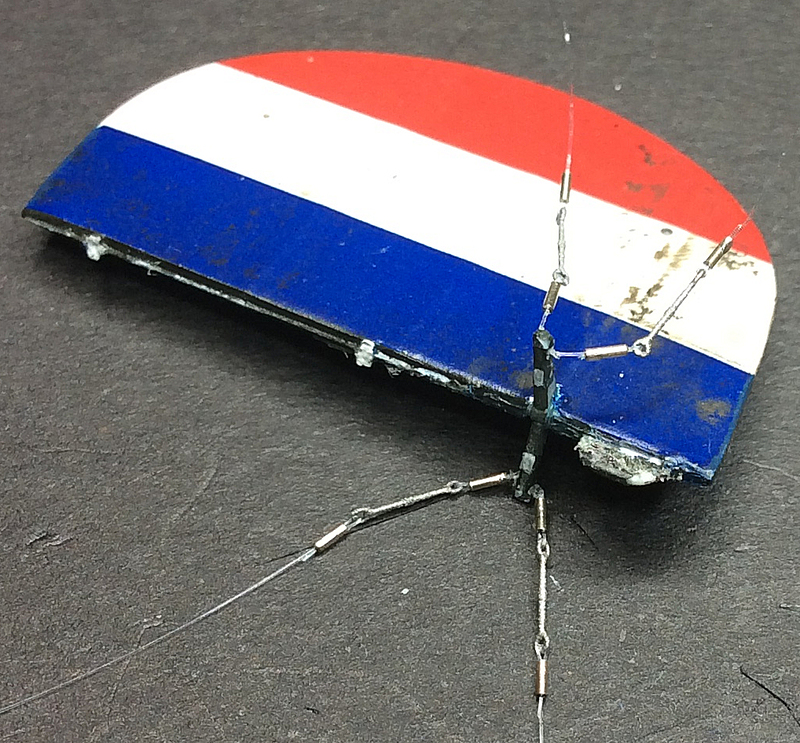 It's hard to conceive that the root connections for the wires can actually hold the tension and I imagine adjusting it all when the wings are in place is rather touchy. Those bits are tricky due to the small size and restricted working area. The wings rigging should be a bit easier as I've pre-rigged the upper wing, so that's half the job. 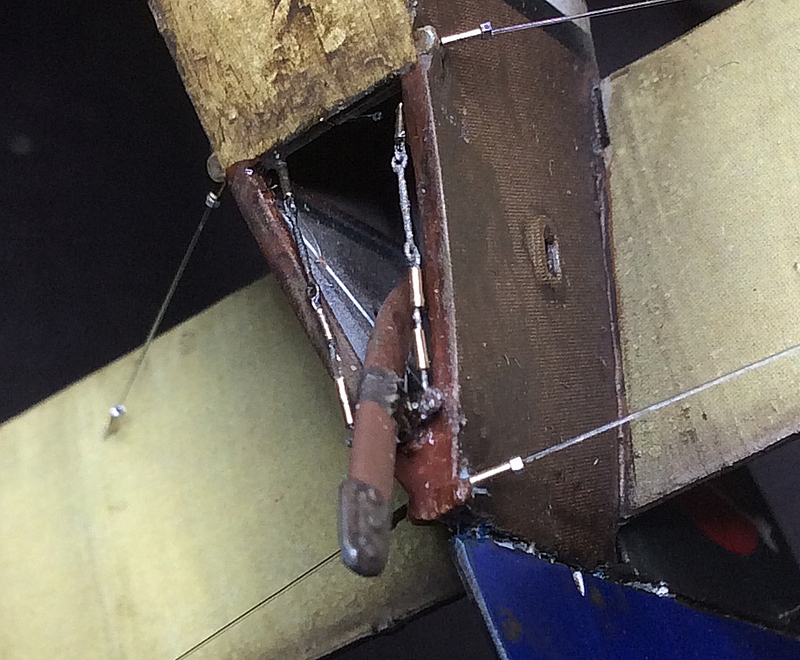 The nickel-silver micro-tubes and aluminium nuts are secured in the model and to the rigging line using thin CA adhesive, so it'll take a fair bit of tension. I normally fully tighten the lines, after they're installed, using heat applied along the line, which shrinks it to take out any slack present. As long as I don't get too close to the line or model of course!!! Are the lines a monofilament painted with metal coating? The mono-filament I use for primary rigging (flying wires, landing wires, undercarriage) is 'Steelon' Fluorocarbon coated 0.12 mm diameter. For cross bracing, control lines and cockpit control lines, I'm using 'Stroft' GTM Silicon-PTFE tempered monofil of 0.08 mm diameter. Both are installed as they comes, which has a steel like finish, the sheen of which is 'knocked back' by airbrushing a clear semi-matte or light sheen sealing coat. The photos posted show reflected light, which gives the impression of a metal coating. 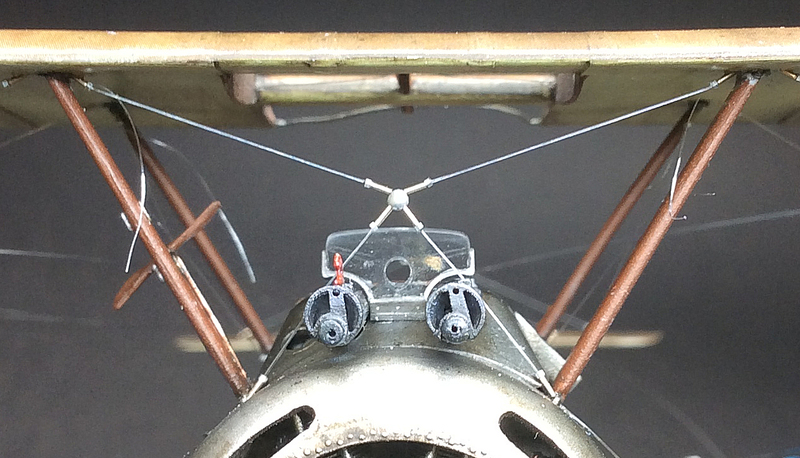 The twin rudder control lines with turnbuckles and the aileron control wire horns have been pre-rigged. The last bit of pre-rigging will be the elevator control wire horns. Wow, an amazing amount of after market product now-a-days!! I must make a point of researching the new products just to keep abreast. So....am I to assume all those cockpit controls are operational?? It's looking extremely fine Mike! (Says Rob, quickly wiping up his drool). So a .5 mm nut is 1/50th of an inch or 20 mils... I can't imagine how you work with something that small, do you have one of those big, stationary magnifiers? I'm straining my reading glasses just to SEE the things! Some day, maybe... some day. Keep up the good work, you are an inspiration! I have seen pictures of his workshop and unless my memory fails me, he does have one of those magnifier lenses, but still, you have a valid point in that although you can see the details with such a lens, it is still an art to have the steady hands holding tweezers to manipulate those incredibly small components. This is also a case of "Patience and Persistence are the necessary Virtues" scanarios! Yes I do use an 8 inch, x1.5 maginification lense which is also LED daylight lit. This in addition to an overhead ceiling mounted LED studio light. Even so, when threading 0.08 mm line through a 0.4 mm tube, I still need to rest my eyes and take a break every now and then. How are you going to send this piece of art to Robert? Pas de pinard, pas de poilu. what type of heat source are you using to shrink the mono-filament. Just wondering if it's a heat gun type. Thanks for the details, Mike & Rob. My son was just by today and he was saying we have to get a modeling desk set up. If I can just get some time. But at 63, I've already got 1.75x readers. 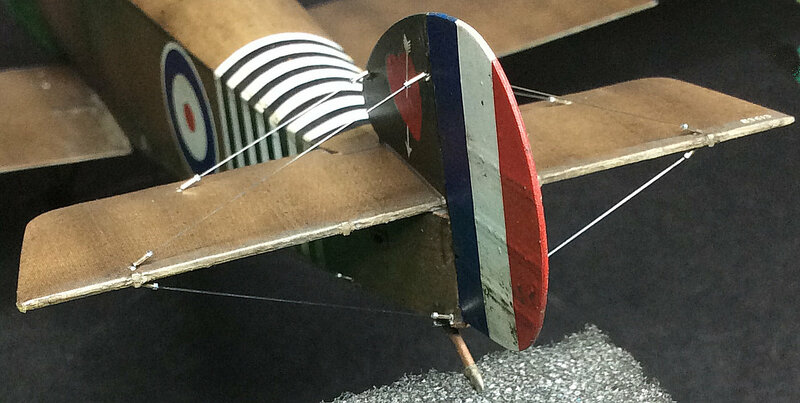 My father-in-law will be 90 in the spring, and he's still building balsa and tissue planes (hence my thread on the Pfalz D3 propeller). But yeah, I do like to detail my models, if I can ever find the time to build. My company has me working as many hours as possible, which is nice on payday, but pretty consuming life-wise. But I sure love watching & trying to learn from these builds. True museum quality! Time to rig the wings!! That's exactly what I'm afraid off!! 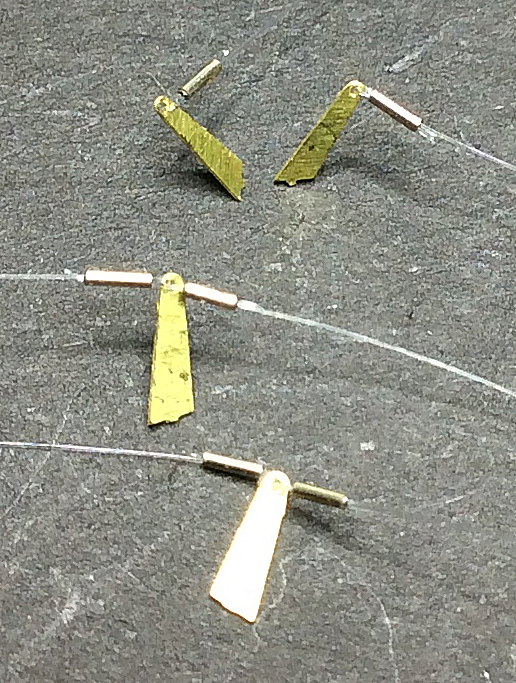 I carefully move a small and pre-heated soldering iron tip along and close to each line - it's fraught with danger but I've found it to be the most effective method. I'm lucky in that I retired in '96 some have plenty of time to research and build these models. My 'man cave' is not that big but does give me the modelling, computer and games PC room I need. Thanks for that tip Mike. 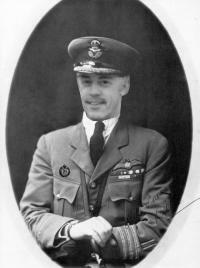 I just wanted to be sure what approach to take if I find any of the wires a little loose during the first flight! 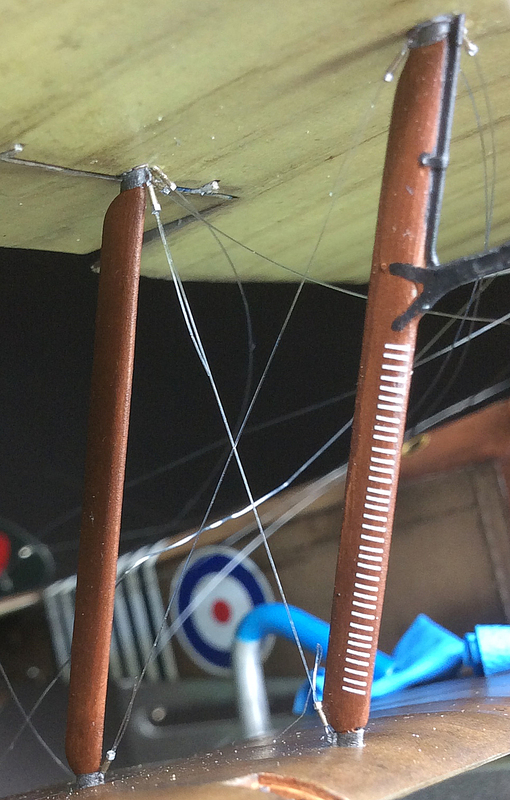 The cross bracing for the outer wing struts, cabane struts and forward fuselage are done. 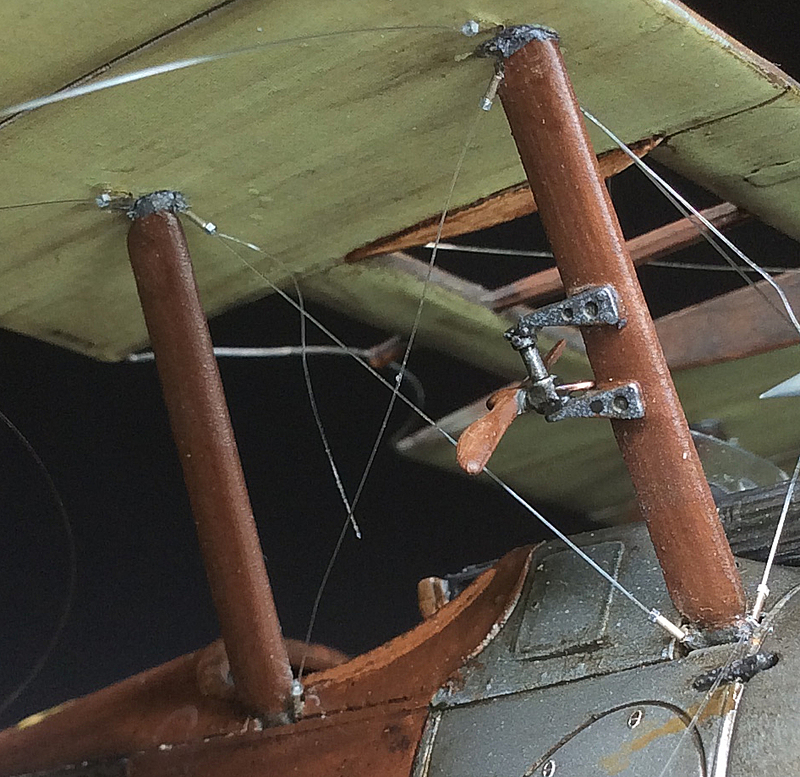 The line tags will be cut away and any slackness in the lines sorted, once the remaining wing landing and flying wires are rigged. The detail of the rigging is just fantastic Mike! I zoomed in on the pics and notrd the twist on each wire. Is that an illusion or is each wire composed of twisted pairs?